There are perhaps two difficult questions here. If a group of people publish a research paper, how do they divide up the credit amongst themselves? And if a breakthrough is a result of a number of papers, by a whole group of people, who gets the acclaim? The convention in my own subject of pure mathematics is usually that on a paper with multiple authors, the names appear in alphabetical order by last name, regardless of who did the most work, who made the largest contribution, or who is most senior. That, at least, is relatively straightforward – although it does mean for example that when reviewing candidates for a job, it can be hard to identify exactly what someone contributed to their joint publications. Since, to everyone’s surprise, the first Polymath project did indeed lead to a research paper, this rule was immediately implemented, and it has continued in this way for subsequent Polymath projects. The discussions that led to the paper are all still available online, on various blogs and wikis, so if someone wants to check an individual’s specific contribution, they can do exactly that – which is not the case for more traditional collaborations. Within pure mathematics, breakthroughs have mostly been attributed to the individual or small group of people who put the final piece in the jigsaw puzzle. That is perhaps unsurprising. If a person gives a solution to a problem or proves a conjecture, then they should get the credit, shouldn’t they? 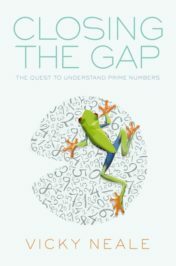 But mathematical arguments don’t usually exist in isolation: most often one piece of work builds on many previous ideas. Isaac Newton famously said “If I have seen further it is by standing on the shoulders of Giants”. If other mathematicians contributed ideas that were crucial ingredients but that don’t have the glamour of a complete solution to a famous problem, how can they receive appropriate credit for their work? 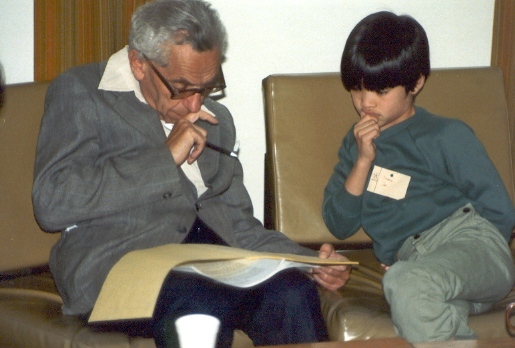 Paul Erdős teaching Terence Tao in 1985, at the University of Adelaide. At the time, Terence was 10 years old. Years later, Terence would grow to become one of the greatest Mathematicians alive. Terence Tao received the Fields Medal in 2006, and was elected a Fellow of the Royal Society in 2007. Photo by either Billy or Grace Tao. CC BY-SA 2.0 via Wikimedia Commons. The public nature of the Polymath projects makes it possible to track progress on some problems in a way that has not previously been possible. In 2010, there was a Polymath collaborative project on the ‘Erdős discrepancy problem’, but the project did not reach a solution. The problem was subsequently solved by Terry Tao in 2015. Tao had been one of the participants in the Polymath5 project on the problem, and in his paper he acknowledged the role that Polymath5 had played in his work. He also built on work by Kaisa Matomäki and Maksym Radziwiłł, and a suggestion by Uwe Stroinski that a recent paper of Matomäki, Radziwiłł, and Tao might be linked to the Erdős discrepancy problem. I am not commenting on this example because I think that anyone has behaved badly. On the contrary, Tao was scrupulous about acknowledging all of this in his paper. Rather, the public collaborative aspect of the story has made it easier than usual to trace the journey that eventually led to a solution. Without a doubt it was Tao who put it all together, added his own crucial ideas and insights, and came up with a solution, but it does seem that others’ contributions were key to the breakthrough coming at that particular moment. I suspect that history will record that “the Erdős discrepancy problem was solved by Tao”, without the nuances. Two of the mathematicians I have mentioned, Tim Gowers and Terry Tao, are winners of the Fields Medal, one of the highest honours to be awarded in mathematics. The Fields Medal is awarded “to recognize outstanding mathematical achievement for existing work and for the promise of future achievement”. I am curious about whether in the future the Fields Medal, the Abel Prize, or any of the other accolades in mathematics might be awarded to a Polymath collaboration that has achieved something extraordinary. Featured image credit: Pay by geralt. Public domain via Pixabay.